How do you do a meal replacement shake the right way? I wanted to write this article because there is a massive obesity issue in our population with skyrocketing incidence of diabetes in young children. 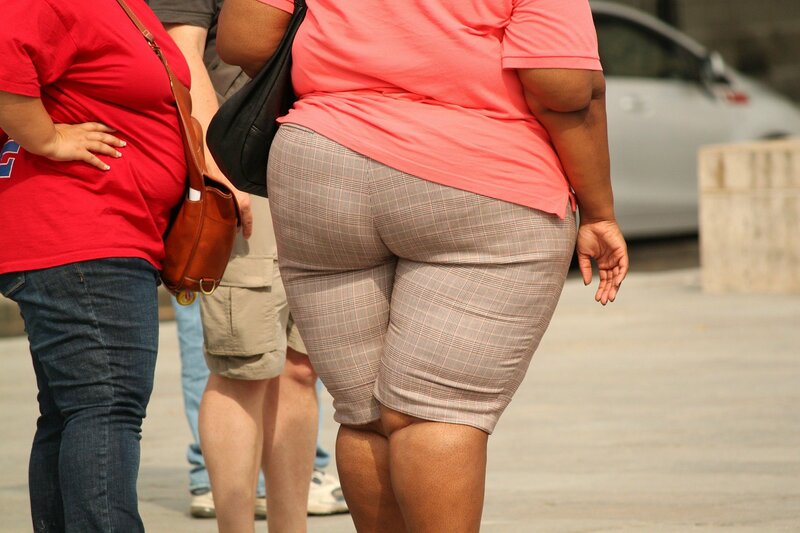 This drives the concern for healthy weight control higher each year. I have heard many conversations about the best meal replacement shakes to buy. It’s extremely difficult and time consuming to figure out the best shake to purchase. Meal replacements have increased in popularity mainly because of convenience. They are very quick, easy to prepare and efficient to use. They are also highly effective assuming you have purchased a good brand containing top quality ingredients. What should you consider when purchasing a meal replacement shake? What’s the difference between a meal replacement and a diet shake? What should you look for in a meal replacement shake? The choice of what is the best shake can be difficult. Many customers purchase without knowing what the standards are and what they should be looking for. The problem is that the food industry is selling protein shakes that are filled with denatured proteins and chemicals, preservatives and other additives. If you are going to purchase a protein shake it is important to understand what is in it. This will lead you to the decision as to whether or not you want to eat it or discontinue use. Further down in the article I discuss some of the main ingredients and their associated health risks. What’s the difference between meal replacement and diet shake? Meal replacement shakes typically contain a full range of vitamins and minerals. They are lower in calories and are often used for appetite control and weight loss. The emphasis is on providing wholesome ingredients that nourish the whole body. Diet Shakes may or may not have a full range of vitamins and minerals. They can have more than 200 calories and are often used as a snack as opposed to meal replacement. With these, the quality may not be as good because they focus more on mass production. If weight loss is your main concern then there are a couple of other strategies that are very effective. Strategy 1: Make sure that you drink plenty of water. Sometimes the body mistakes thirst for hunger. Click here for more information on water. Strategy 2: Make sure that you get plenty of sleep. If you do not get enough sleep it can affect your metabolism and make it very difficult to lose weight. So, What Should You Look For In A Meal Replacement Shake? The following is from www.dietsinreview.com. They suggest looking for the following things in your meal replacement shake. Limiting sugar content: While it does provide a pleasantly sweet taste, sugar has been linked to metabolic disorders and overall weight gain. This is why it’s best to seek out an alternative or low-calorie sweetener such as stevia. This plant-based sweetener has been shown to not have an effect on diabetics, so as to not negatively affect blood sugar levels. What Are Real Food Sources Of Protein? Is Your Protein Drink/Meal Replacement Safe To Consume? 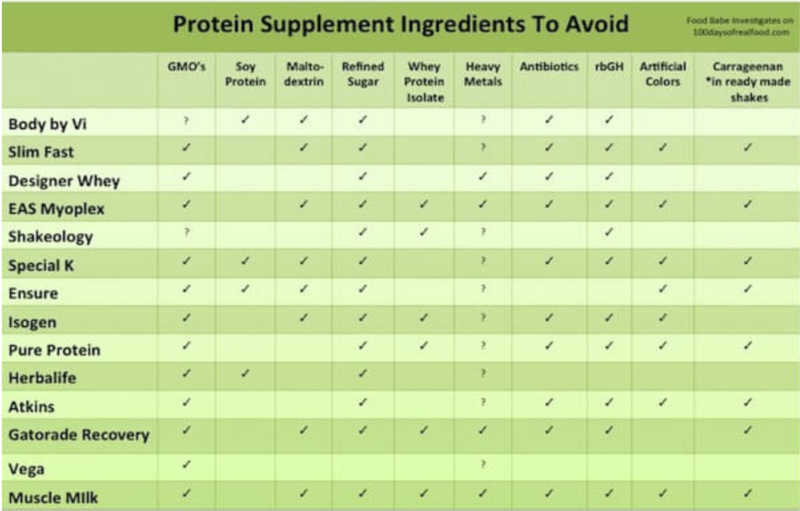 A majority of the meal replacement shakes use either soy or whey as their main protein source. In an article from www.100daysofrealfood.com, they discussed not only soy and whey but Maltodextrin and Acesulfame Potassium. Many protein drinks use soy protein concentrate or soy protein isolate in conjunction with other proteins. Over 90% of the soy produced in this country is GMO – but that’s not the only reason to avoid soy protein. When soy is looked at from a macronutrient perspective, it can give the illusion of a very healthy food – full of plant-based protein, essential amino acids, and fiber. However, the soy that is grown and produced today is largely hybridized, making the amino acids largely indigestible leading to digestive issues that have caused many people to be allergic to soy. What’s worse is when soy is isolated to just its protein state, it becomes severely denatured and can cause hormonal disruptions because of the excessive amount of estrogen contained in it. Soy also has an abundance of phytic acid that leeches calcium and other vital minerals from your body. Calling out an ingredient filler like maltodextrin may make you think I’m being nitpicky – but is this carb substitute that is likely derived from genetically modified corn really necessary in protein powders? Maltodextrin can be used to make a substance like “fibersol” that, for instance, is in the Body by Vi Shakes. This fibersol is made by heating maltodextrin at very high temperatures and treating it with enzymes and acids to make a fiber your body simply can’t digest and makes you feel artificially full. If you are eating enough plant-based foods, there is no reason to supplement with this type of chemically derived fiber. Fibersol is just another additive that does absolutely nothing for your long-term health. 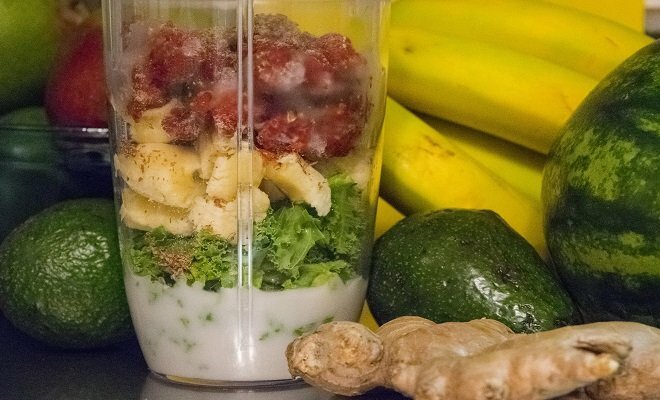 Why not add a real food like spinach or a banana to your smoothie instead? This is the most common form of artificial sweetener available in protein drinks (and tons of other processed foods) today and according to the Center for Science in the Public Interest (CSPI) it is anything but safe. CSPI reported the safety tests of acesulfame-K that were conducted in the 1970s were inadequate. Specifically, two rat studies suggest that the additive might cause cancer, but these studies were never addressed by the FDA before they approved the substance to also be used unregulated in soft drinks. In addition, it is mentioned that large doses of acetoacetamide (a breakdown product of this sugar) have been shown to affect the thyroid in rats, rabbits, and dogs. This toxic sugar substitute can be found in EAS Myoplex, Isogen, Pure Protein, Atkins, and Muscle Milk. So, at this point, you may be wondering what you should do. You are a busy person and want to use a healthy meal replacement shake. Don’t worry, I have a recommendation for you. I have found a meal replacement shake that is healthy. It is easy to use and does not have any added sugar, salt artificial coloring, artificial flavors or preservatives. It is free of GMOs, soy protein, maltodextrin, refined sugars, whey protein isolate, heavy metals, antibiotics, rbGH, artificial colors and carrageenan. It has medium chain triglycerides that function as “brain-food”. MCTs provide nutrients for mental sharpness and are a metabolic booster which aids in fat burning and weight management. Enzymes that aid in digestion and nutrient absorption and a balanced formulation of vitamins, minerals, and amino acids. It also contains organic moringa and naturally sweet monk fruit in addition to organic pea protein (one of the proteins most easily absorbed by the body) and organic vegetables. It is designed to help burn fat and boost metabolism as well as promote healthy brain function and the elimination of toxins in the body. With pre- and probiotics to assist in digestive and immune system activity. It has 120 calories and there are 30 servings per container.